StarCompliance is dedicated to providing the highest standards of personalized service and support to your business. Our team of compliance technology specialists will support you every step of the way as you implement the STAR platform in your business – from initial advice and planning, through to configuration, migration, deployment and ongoing support. To assess the benefits of the STAR platform for your business, we can arrange an initial proof of concept implementation. This will give you a sub-set of the system for testing, evaluation and comparison with alternative systems. If you decide to go ahead with full implementation, you will be assigned a dedicated implementation team. They will manage the entire process, from assessing your requirements and planning the installation, through to configuring the software, integrating all data feeds and fully testing the system. Providing a smooth, timely implementation and migration experience is of the highest importance to Star. The implementation and migration team leverage a robust project management tool, providing you complete access and transparency across the entire lifecycle of the project. Gain insight into open tasks, upcoming milestones, and the project timeline. Upload and share files across a secure connection, create unlimited users and assign roles, run and export project reports, and more. With real-time insight into the progress of your implementation, you can remain confident and stress-free as we work diligently to meet your go-live date. 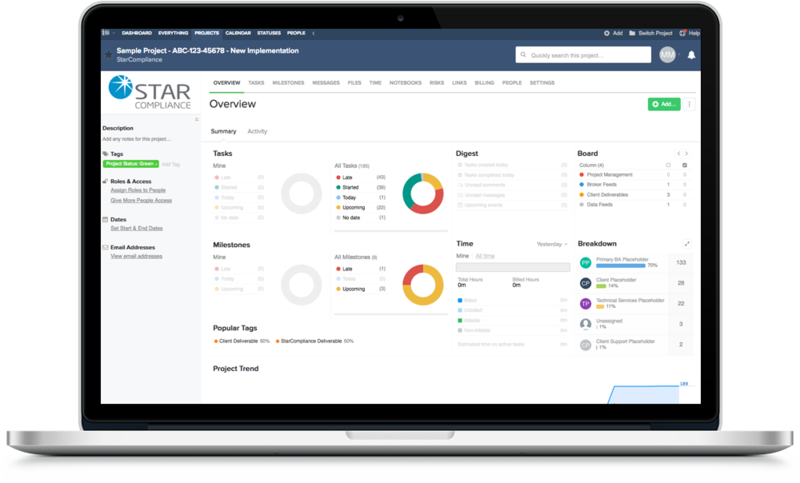 You also have access to a robust knowledge base, user guides and monthly training webinars to support your day-to-day usage of the STAR compliance technology. New resources and training sessions are also available whenever new features and enhancements are added to the platform, ensuring you can take full advantage of the software.